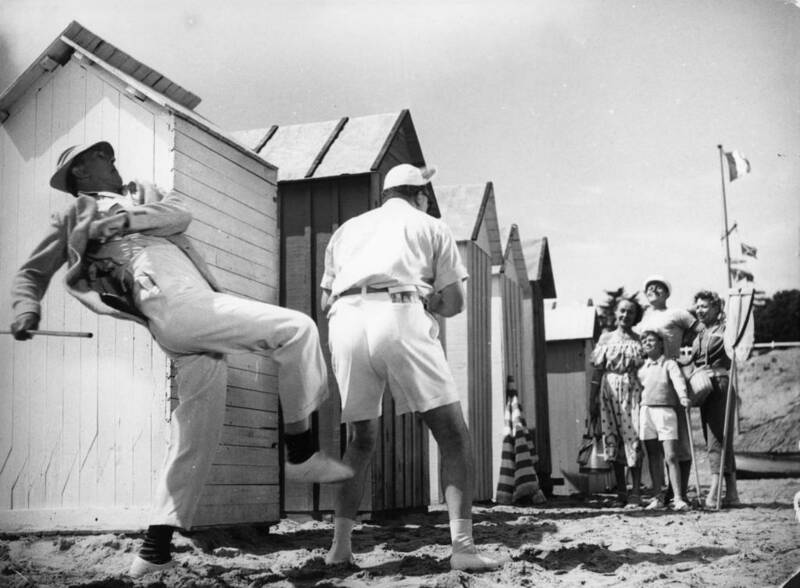 Jacques Tati’s glorious comic masterpiece, Monsieur Hulot’s Holiday follows its lovable, gauche protagonist as he attempts to relax “en vacances”. Shy and complex, the geeky Monsieur Hulot (Tati) – clad in trademark trench coat, short trousers and stripy socks – aims to please but with his unfortunate clumsiness, usually ends up upsetting people instead. Tati gently mocks the more rigid types in French society who watch in horror as Hulot inadvertently barges in on a funeral, sets a fireworks stand on fire with his pipe and topples a Ming vase – rarely noticing the trail of destruction behind him, and all the while trying to impress a young ingénue. Minimal dialogue, an innovative use of sound, lighting and composition combine to make the film feel ahead of its time; an effortlessly well-choreographed fusion of sight gags, slapstick and satire which launched Tati and his alter ego to international stardom.